Deb's Cup of Tea: Another Gone. 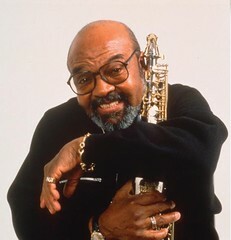 James Moody died today at the age of 85. He had pancreatic cancer. the name may not mean anything to anyone who doesn't listen to classic jazz. I have one of his albums in the stack. I had the good fortune to hear him in concert twice. The first time was at Ravinia in the early 1990's. We went with a group from church. We were supposed to hear Mel Torme in concert but he was ailing. Instead we got a trio whom I don't remember, James Moody and Cleo Lane. I had never heard of Cleo Lane but some of the people in the group knew her from her World War II USO trips. She was moderately okay. The only thing I remember about the trio was this flute player who was phenomenal and I don't remember his name. The second time I heard him was in concert at Orchestra Hall. He was on the bill with Benny Carter, I believe. I had the funds then to afford really good seats. I think I was something like 6 rows from the front. Moody played more than just an alto sax. At both concerts, he played flute and piano. He wasn't a very big man but when he played his horn, it was just him, us and the music. Nothing else was in the room. I remember closing my eyes at the Orchestra Hall concert and having the feeling of the music washing over me. I like that feeling. There aren't many of these lions of jazz left. Dave Brubeck just celebrated his 90th birthday. He kind of reminds me of George Burns who was booked to do a show when he was 100. People like Moody paved the way for today's jazz musician to play the music they love with less of the hardships endured. Moody isn't well known but the imprint he left on jazz won't be erased.